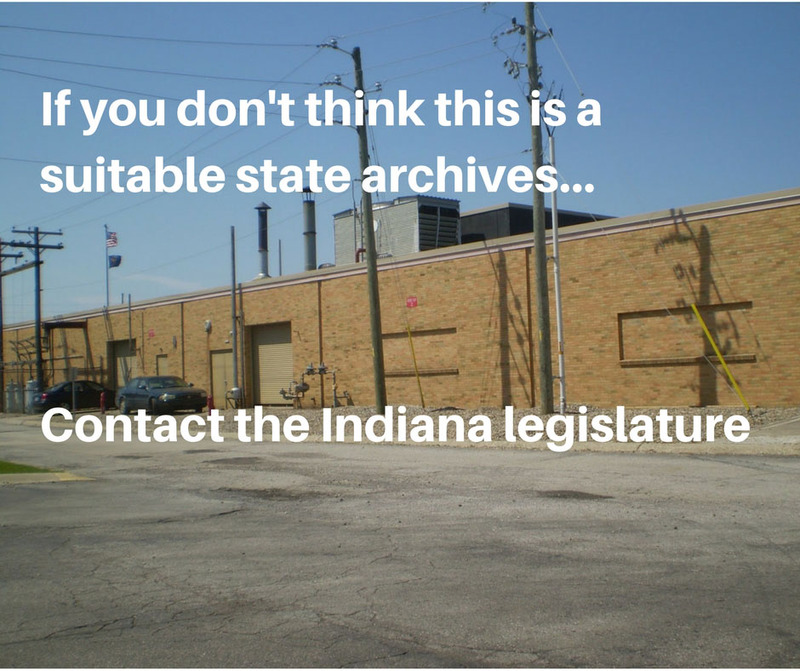 Earlier this month, we told you that the funding for building a new Indiana State Archives was in jeopardy and that conditions at the current warehouse site were rapidly deteriorating, with several leaks just in the last month. Representative Matt Pierce of Bloomington has introduced an amendment (Amendment 16) to this year's state budget proposal (House Bill 1001) which would include $27.5 million for building a new Indiana State Archives. The money would come from the state's general fund. 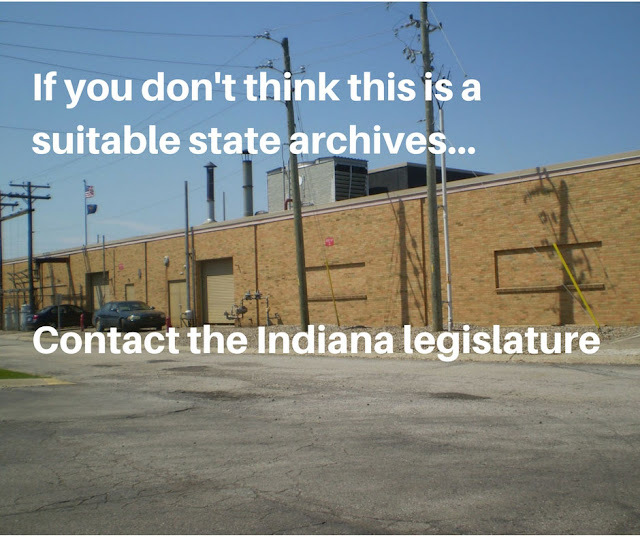 We urge everyone to contact Indiana legislators about supporting this amendment (Amendment #16 to HB 1001), which would finally give the state that touts itself as the "Crossroads of America" its first true State Archives. If you need some talking points about the importance of a state archives, the Council of State Archivists has an informative pamphlet, "The Importance of State Archives." Making your voice heard is the most important thing you can do for Indiana's history. The Indiana State Archives "temporary" building that it's been in for years. 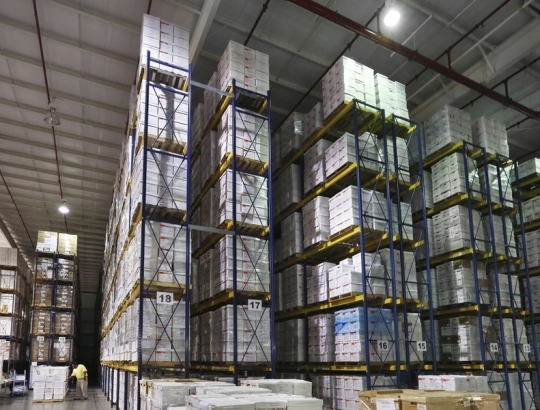 It's literally a warehouse. Seeking information on Joshua Dunkin Blackwell and wife Samantha Jane Helton Blackwell. He was born in 1822 Dec. 10; Died 14 Dec.1893 in Polk Twp., Monroe Co., Indiana. Samantha Jane Helton Blackwell, born on 29 July 1829, in Pleasant Run Twp. Lawrence Co.; Died on 31 May 1915 in Heltonville, Lawrence Co.
Thomas Bates and Lydia his wife are listed in the 1860 Posey County, IN census in Black Township. I cannot find them or any the people living with them or around them after 1860. I wondered if Thomas owned any land or left any records that would tell me where they might have migrated to? Hello! I am wondering if you can assist me or point me in the right direction. My great grandfather was adopted. The story is his parents were college students and dropped him off at an orphanage in Fort Wayne the day he was born. The orphanage was Catholic and had nuns. He was also there long enough to have been baptized. His adoptive parents were Brady and Marie Reidenbach. He was named Theodore Jerome Reidenbach with a date of birth of June 4, 1916. I have no idea how to search for his information. If You can guide me or point me in the right direction I would greatly appreciate it Thank you! Does your genealogy or history organization want to learn more about digitizing records? 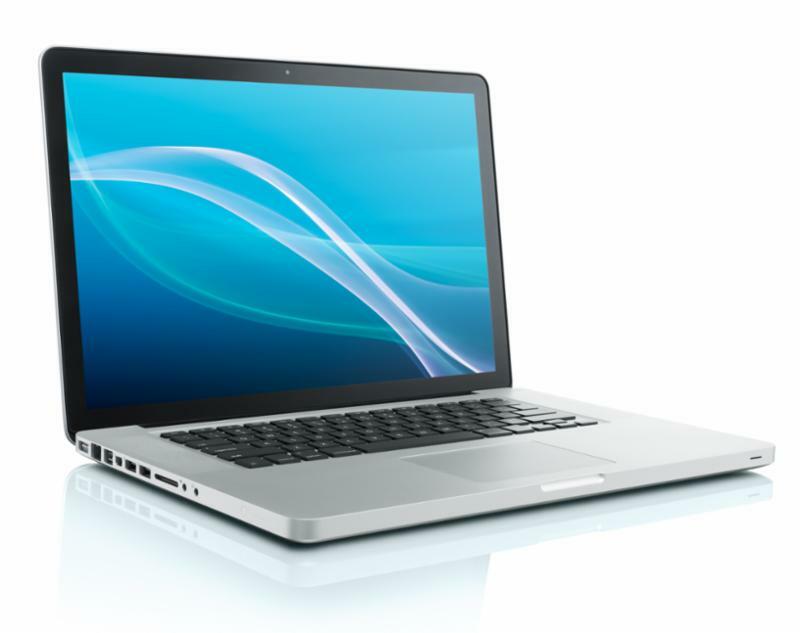 Connie Rendfeld, Digital Initiatives Librarian for the Indiana State Library, will talk about how to plan your digitization project before you start scanning. 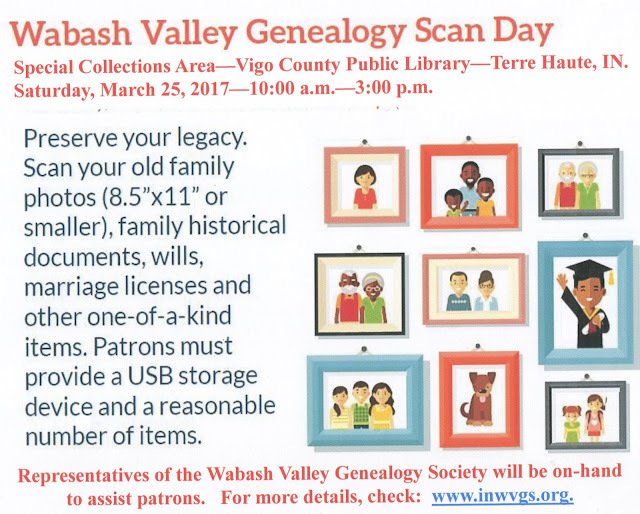 Ramona Duncan-Huse and Susan Sutton from the Indiana Historical Society will talk about how to preserve records and how to choose what you should put online. Ron Darrah from the Genealogical Society of Marion County will lead a panel discussion on local digitization projects. Tours will be given of the Indiana Historical Society's Conservation Lab and their William H. Smith Memorial Library. 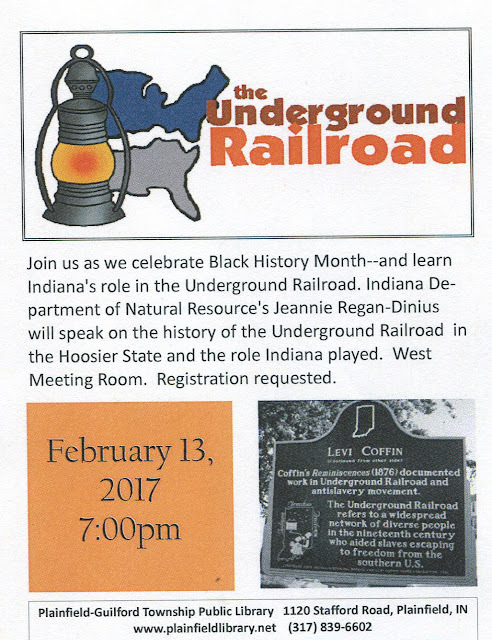 Registration for the seminar is just $5 per person, and there is free parking available in the Indiana Historical Society's parking lot. The Society's Stardust Café (on the canal-level) will be open for lunch. Planning for the new Indiana State Archives building in Indianapolis (which the Indiana General Assembly approved $25 million for in spring 2015) has been at a standstill for the last few months. Recently a deal fell through to pay for it by selling the state's cell-phone towers. Your help is now needed to ensure that it gets fully funded. More delays could be catastrophic to what is housed in the current building on East 30th Street. According to the Friends of the Indiana State Archives (FISA), since January 1st there have been 5 leaks in the building - including one in the vault that holds the state's most important treasures (such as the 1816 constitution). Another of the recent leaks was caused by a bullet hole. The environmental conditions in the building continue to deteriorate - a new building is not simply a way to help celebrate the state's bicentennial, it is a vital piece of infrastructure that will have long-term benefits. The Indiana General Assembly is currently drafting the state's budget, and they need to hear from those who are impacted by the Indiana State Archives. If you live in Indiana, you can also contact your specific legislators. You can find contact information for your specific legislators here: https://iga.in.gov/legislative/find-legislators/. This looks like a great idea. Does your local group have a similar project? IGS may help: See our Digitization Project. If you are in the Plainfield area on Monday, you might want to join this session at the Library there.